The sweater is a thick polyester like material that's sports jersey-like on the outside but soft on the inside. 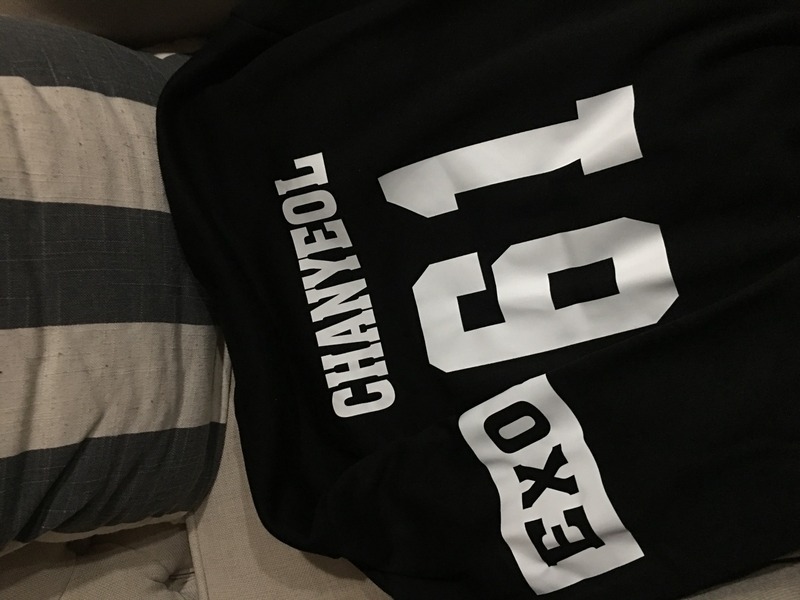 The appliques with your bias's name (I got Chanyeol) are a thick material but they're well adhered so you don't have to worry about them coming off easily as long as you wash the sweater inside out! Very warm, decent quality. The shipping took about two weeks (one to process, one in actual transit) which is a bit long but the tracker was updated regularly. Also, I got a rubber bracelet as well which was a lovely touch. Worth the money, I'm planning to buy a Sehun (my bias wrecker) one next! I orderd the Exo jersey sweater and it was so comfy!! I may have understood the size chart a bit wrong and it was a little tight but overall awesome material and very cozy! Did also take a while to deliver but would definitely buy from here again!! Super snuggly, super warm, and super cute!